Nicholas Halbert has been immersed in the tradition of sacred music since the age of 8, when he began singing as a Boy Chorister at St. Paul's Cathedral, San Diego. At the age of 16, he was appointed the Organ Scholar there, and became the principal accompanist for all of the Cathedral choirs, an experience comparable to the training of many English organists. 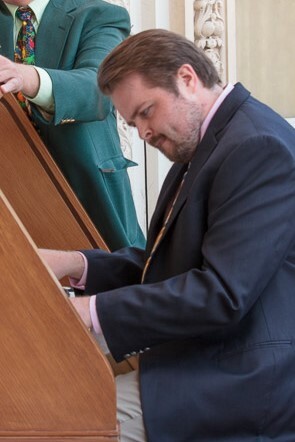 After two years in that post, Nicholas Halbert went to the Eastman School of Music where he studied organ under Nathan Laube and fortepiano and harpsichord with Edoardo Bellotti. While at Eastman, he also wrote a senior thesis on the intersection between modern political thought and the world of classical music. Nicholas is now enrolled in the Master's of Music program at SMU, studying organ with Stefan Engels and conducting with Paul Phillips. Beyond playing the organ, Nicholas is constantly developing his skills as a vocalist and a choral conductor. He loves when he can return to San Diego, and can usually be found either body-surfing at O.B. or giving night tours at the Whaley House.